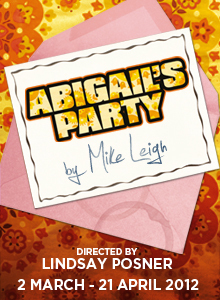 Last night Stu treated me to a night out at the theatre - we went to see a revival of Mike Leigh's fabulous Abigail's Party at the Menier Chocolate Factory in London's glitzy London Bridge Quarter. This production starred Jill Halfpenny as Beverly, Joe Absolom as Tony, Natalie Casey as Angela, Susannah Harker as Susan and Andy Nyman as Laurence. And they were all excellent. We laughed and laughed. Many of the scenes are iconic of course after the 1977 BBC production - itself based on the original Hampstead Theatre one. Wisely they don't mess too much with what worked so we had a great night laughing along to our favourite lines. Beverly: Now I can see what you've done, Ange - you've just sat down and put on your lipstick. Next time, will you try this for me? Just sit down, relax, and say to yourself "I have very beautiful lips" and I tell you, Ange, you're gonna see the difference! All right?! Angela: Is it real silver? Angela: Oh it's funny. We were all getting married about the same time as you were... getting divorced! Angela: I got very drunk on champagne at our wedding, do you remember?